For Your Special Unicorn Fanatic Or Little Princess! Not available in stores! This design is a one-of-a-kind, available while stocks last! 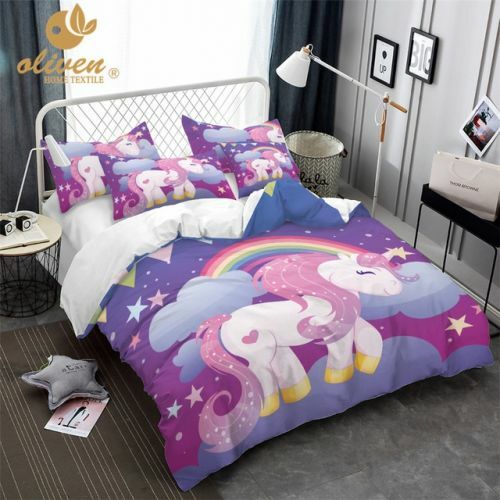 A beautiful bedding set with unique screen printed colorful unicorn design, this set comes in a 200 thread count and is machine washable. Please review the sizing chart in detail below to select the correct size for the bedding you intend to use. These are a wonderful gift for a special birthday or the holidays upcoming for that little girl who simply adores unicorns, ponies, princesses and all things enchanted! SELECT YOUR SIZE & HIT ADD TO CART ABOVE! 1. Please follow the size of your quilt / comforter / duvet and check with the size guide to select the correct size. 3. The item's color may be differ slightly from the photos. 4. Slight difference in sizing within 5cm / 2" is allowable and will not cause issue. 5. Suggestion of cold water washing only. We cannot take responsibility for issues or damaged caused from improper washing.